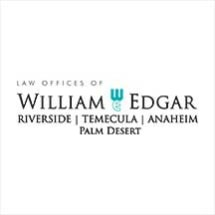 If you live in Riverside County or any of the surrounding areas, and you are going through a divorce or have some other serious family law matter you need to address, you can turn to the attorneys at the Law Offices of H. William Edgar for the quality, personalized representation and support you deserve. Since we began our practice in 2004, we have become one of the region's leading law firms for all divorce and family law issues, and our attorneys have earned numerous awards and honors. Along with holding perfect ratings on Avvo, we have also won the Client Distinction Award, and both Inland Empire Magazine and the American Society of Legal Advocates have voted us as being among the top family law attorneys in the region and the country. Considering the stress and anxiety you are likely feeling regarding your situation, you can trust that we will work closely with you and provide the compassionate, caring support you and your family need. We also possess extensive experience with alternative dispute resolution methods, such as mediation and collaboration, so we can help you resolve your matter and reach agreements as amicably and efficiently as possible. For more information on how the Law Offices of H. William Edgar can best serve you and your family in your time of need, you can call our office or visit our website to schedule a free initial consultation.